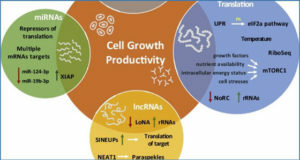 lncRNAs are a large and diverse class of non-protein-coding transcripts longer than 200 nucleotides.lncRNAs have recently gained widespread attention and have been shown to have crucial roles in various biological regulatory processes. 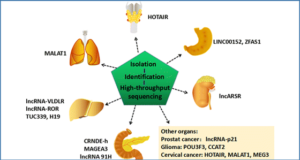 lncRNA sequences are conserved, and lncRNA expression profiles in adult tissues are broad. 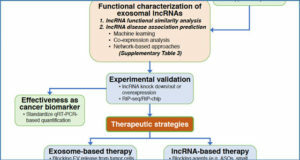 lncRNA messenger RNAs (mRNAs) are generally less abundant than protein-coding mRNAs but exhibit stronger tissue- and cell-specific lncRNA expression patterns. Osteosarcoma is the most common malignant bone tumor in children and adolescents. It is a genetically unstable and highly malignant mesenchymal tumor of bone characterized by structural chromosomal alterations. Malignant osteosarcoma cells produce osteoid matrix and fibrillary stroma. The most common osteosarcoma subtypes are osteoblastic osteosarcoma, chondroblastic osteosarcoma, and fibroblastic sarcoma. Osteosarcoma occurs predominantly in adolescents and young adults and accounts for ~5% of childhood cancers. 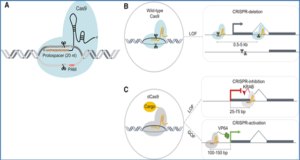 To date, the molecular mechanism underlying osteosarcoma development remains unclear. 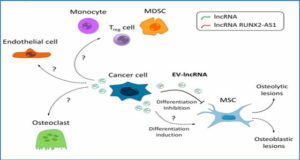 The majority of previous studies have focused on protein-coding genes as crucial components involved in the progression and metastasis of osteosarcoma and have overlooked the vast landscape of noncoding genes. 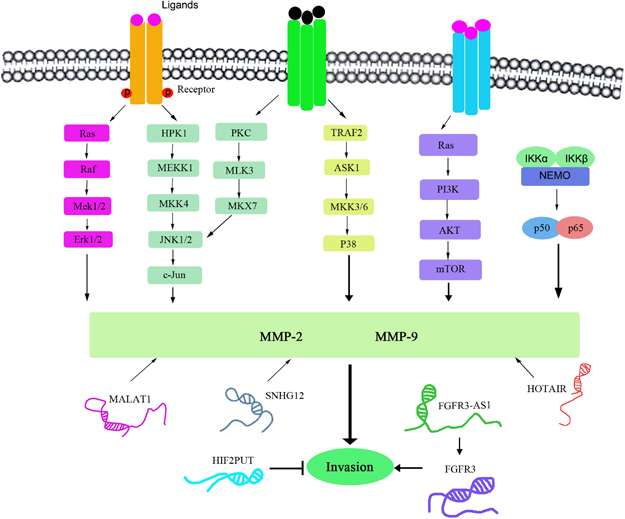 During osteosarcoma cell invasion and migration, several lncRNAs reportedly promote or inhibit cell proliferation and invasion by regulating MMP-2 and MMP-9 secretion. 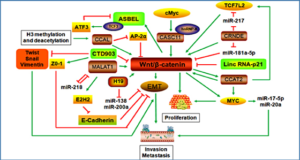 Osteosarcoma cell invasion and metastasis and the lncRNAs associated with these processes are shown below.